The overall aim of our intensive care management has also been to protect the brain, to ensure perfusion to the brain and meet its metabolic demands. We should always be thinking about how to ANTICIPATE, PREVENT, or HALT secondary brain insults regardless of whether we are looking after a specific neurocritical patient, or a septic patient! The concept of different pathophysiological mechanisms cannot be overstressed. Following the primary cerebral insult, a cascade of events amplifies the initial damage regardless of the etiology of the precipitating event. Cerebral hemorrhage, edema, and axonal injury can present similarly, but have drastically different clinical trajectories. If we look at structural changes, here at a macroscopic level we might see damage includes shearing of white-matter tracts, focal contusions, hematomas (intracerebral and extracerebral) or diﬀuse swelling. Each type of head injury might initiate VERY diﬀerent pathophysiological mechanisms, with variable extent and duration. These mechanisms (acting concurrently and often with synergising eﬀects) and the intensity of systemic insults determine the extent of secondary brain damage. 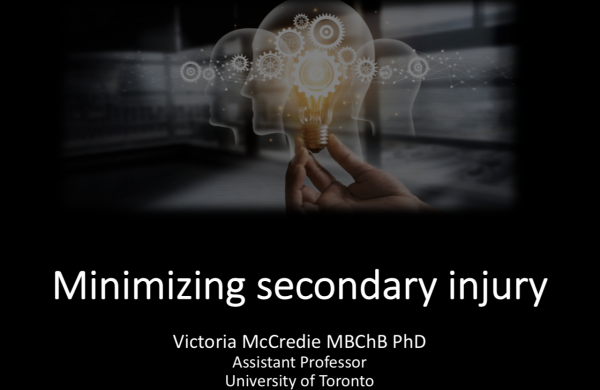 Secondary brain injury processes develop over hours and days, and include neurotransmitter release, free-radical generation, calcium-mediated damage, gene activation, mitochondrial dysfunction, and inﬂammatory responses. Despite repeated failures in pharmacological neuroprotection, outcomes for TBI patients have improved. Likely that the organization of intensive treatment has contributed, offering a different kind of neuroprotection based on careful prevention and limitation of intracranial and systemic threats. How do we detect secondary brain insults in a comatose patient? With mounting evidence that a single neuro-monitor cannot comprehensively detect all instances of cerebral compromise, multimodal neuromonitoring allows an individualized approach to patient management based on monitored physiologic variables rather than a generic one-size-fits-all approach targeting predetermined and often empirical thresholds. We are seeing a change from pure neurological clinical evaluation to an era of structural definition, associated with monitoring of cerebral hemodynamics, oxygenation, metabolism, and electrophysiology. It remains to be demonstrated whether multimodal monitoring-guided therapy is able to improve outcome. How can protocols improve patient care? Secondary brain injury is a frequent event in TBI patients. These events greatly influence prognosis and are potentially preventable. Our understanding of secondary brain injury mechanisms and physiologic responses to treatment is evolving.